[MARCH 10, 2000] Do you remember the "Newlywed Game" on television? Newly married couples were separated, asked the same questions and then were asked on camera to predict how their spouse answered. The humor of the show resulted from the seemingly wild differences in their answers. It also demonstrated that they didn't know each other as well as they thought. How would church members and ministers do in such a blind quiz? Would they know each other and their congregation or would their assessments be wildly different? When you question the members and ministers of First United Methodist Church in Lincoln about their congregation there is great consistency in their answers. It is evident that they share the same vision of their church and its mission because they all note the same strengths and commitments. When members were asked about the strengths of First United Methodist there were three jubilant answers: caring for each other, a strong dedication to missions and the importance of ministering to youth. Gaila Sherwood, a lifelong member, described her church using one word, "Love!" She went on to explain, "The members love each other and care for one another." She also noted that her church is an excellent teaching church and offers many different types of learning and many expressions of caring. After visiting her church, it is clear that this love and care are not merely local and self-centered; this is a church anxious to support and participate in missions. The Methodist Church is Lincoln's oldest, continuously meeting church body. The church was formally organized in Lincoln in 1840, but Methodist meetings had been held for some time before that, as circuit riders passed through the area preaching to gathered settlers and their families. Even though the Methodist church meeting in Lincoln in the year 2000 exists in a world and culture very different from that of its founding by John and Charles Wesley in England in the 1720s, it has not forgotten its historical or theological roots. The Rev. Larry Maffett, directing pastor of the church, notes that just as "the Wesleys used 'study groups' to minister to the common people," this congregation uses small groups and personal ministries to reach people. 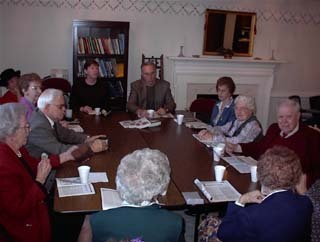 The church offers study and fellowship throughout the week for people of all ages. According to Tami Letterle, a young adult member of the church and a Lincoln College student, her church offers many opportunities and classes. She noted that the worship for teens allows them an active, contemporary service, "rather than just sitting around." Tami works with the church's Kid’s Club program that provides after school activities and study for children whose parents are working. Kids can work on their homework and share fun activities, all in a Christian environment. The church also offers a before-school program for children whose parents must be at work at an early hour. Kid's Club becomes Kid's Camp during the summer months and provides full-day activities for approximately 55 children at a reasonable cost to their parents. It is clear that the Biblical and historical heritage of this church is given practical application for the future. During our interview, the Rev. Maffett shared the vision of the congregation for the coming months. Among the goals of the church are developing new structures for ministry, ministry teams for discipleship, ministry to young families, spiritual growth through small groups and integrating non-participating members into the ministries of the church. Outreach and missions quickly come to the fore in any discussion about First United Methodist. The Rev. Maffett pointed out that their building at 302 Broadway is a meeting place for worship, but "our work is beyond the walls." Church members pointed out the congregation's long involvement in the Food Pantry here in Lincoln. He and others pointed out the ministry of V.I.M.-Volunteers in Mission, who provides practical help to people in need. Twice this year a cross section of members will travel to Appalachia and build a house for a poor family. Church members have been undertaking such trips for 20 years. Even as they maintain a vision and commitment to world missions, First United Methodist is also concerned with ministering to its community and its members. Worship services are held Sunday mornings at 8:30 and 10 a.m. with Sunday school at 10 a.m.
On Sunday, March 5, I attended worship and visited both adult and youth classes. My visit coincided with Transfiguration Sunday in the liturgical calendar and preparation for Shrove Tuesday and Ash Wednesday, which would be observed during the week. The atmosphere of worship was enhanced by the sanctuary of the church—a beautiful facility with soaring ceilings, which draw the spirit and the attention of the congregation upward. A highlight of the service was the stirring music of the pipe organ played by Jeff Hendricker, who also accompanied the Chancel Choir under the direction of Chuck Laughery. The Rev. Maffett's sermon on the Transfiguration was a thoughtful and touching reminder of the "mountaintop" experiences in Christian faith with a focus on missions to Appalachia. 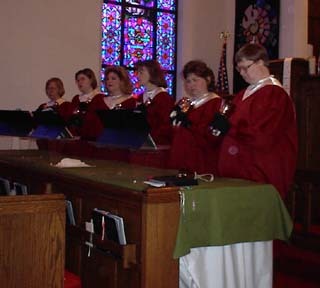 In the second worship service of the morning, one of the three handbell choirs in the congregation shared its unique music. 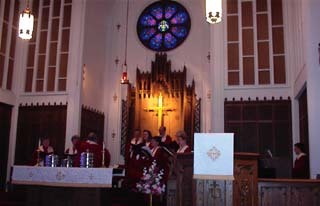 During the adult worship services, special worship services for children and for teenagers are held in the chapel. These services include music and lessons geared toward young worshippers. I observed Rob Siebert, minister for youth, as he led the high school and junior high worship service, which focused on friendship. I also dropped by a class for senior adults taught by William and Janet Overton and joined an adult class taught by Randy Schrader as the group discussed the Lord's Prayer and integrating prayer into every hour and every day. The Rev. Larry Maffett, the Rev. Ray Hudson, and lay minister Rob Siebert guide the ministry of First United Methodist and shepherd dozens of volunteers. Maffett and Hudson came to the Lincoln church in 1997. Maffett was a music educator and school administrator for several years before he acted on the "vision of ministry" he had received as a teenager. After attending seminary in Evanston he served six Illinois congregations before coming to Lincoln. Hudson, a seminary graduate of the University of Dubuque, oversees small group and youth ministries, missions, and pastors the church's affiliated congregation in Beason. Siebert works with the youth of the church and is a graduate of Lincoln Christian College. First United Methodist Church is a body of active Christians who, according to their mission statement, "want to follow the way of Jesus to find joy, happiness and the practical usable power of the Christian faith."